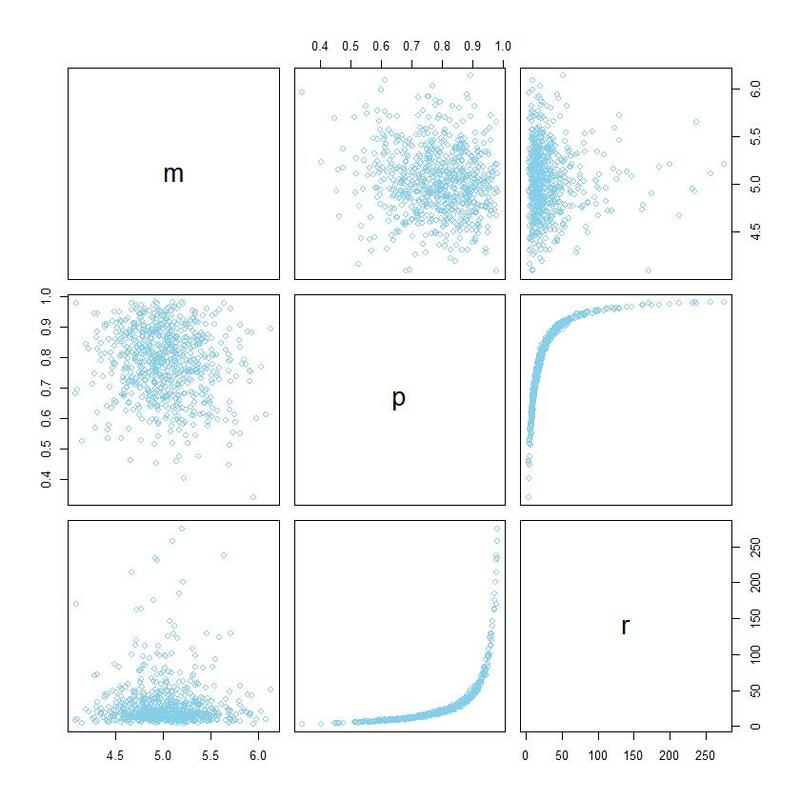 I have noticed that when estimating the parameters of a negative binomial distribution for describing count data, the MCMC chain can become extremely autocorrelated because the parameters are highly correlated. 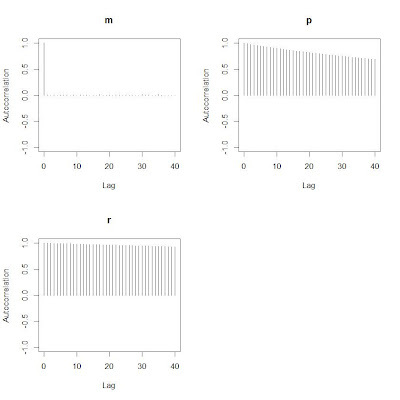 Question: There must be some standard re-parameterization, or other approach, to reducing this autocorrelation. Can someone point me to it? Here is an example of what I mean. First, a histogram of the data, consisting of a 50 individual counts. (E.g., for each of 50 subjects, the number times they checked their e-mail in the last hour.) 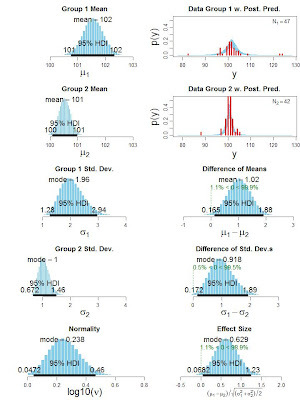 The histogram of data has posterior-credible negative binomial distributions superimposed. As I said above, there must be some well-known way to address this issue. Can someone point me to it? Thanks. Classroom-based review in J. of Math. Psych. 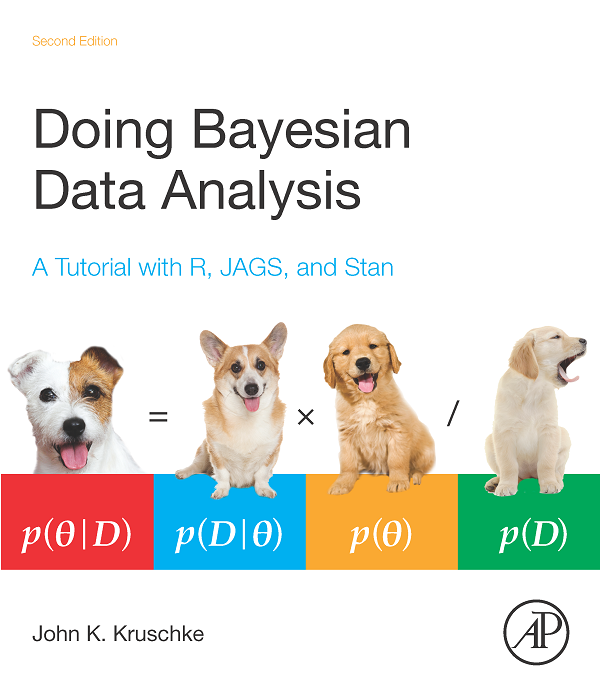 Big thanks to Wolf and Francis for using the book, and for the thoughtful review! A discussion forum has been added to the blog. The forum is linked in the right sidebar of the blog. My thanks to Anne Standish for searching out information about how to set up the forum, and directing me to it. 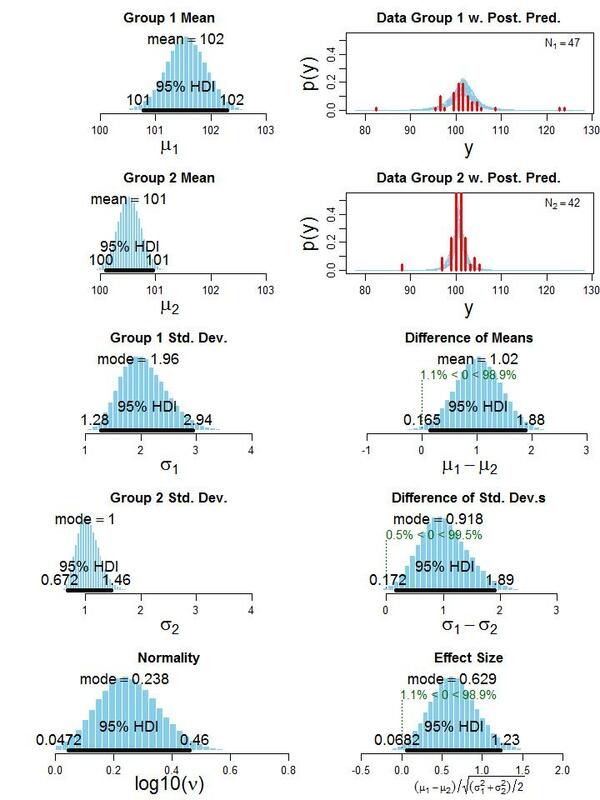 Bayesian estimation for two groups provides complete distributions of credible values for the effect size, group means and their difference, standard deviations and their difference, and the normality of the data. 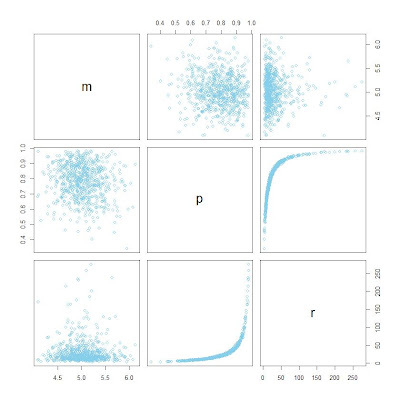 The method handles outliers. 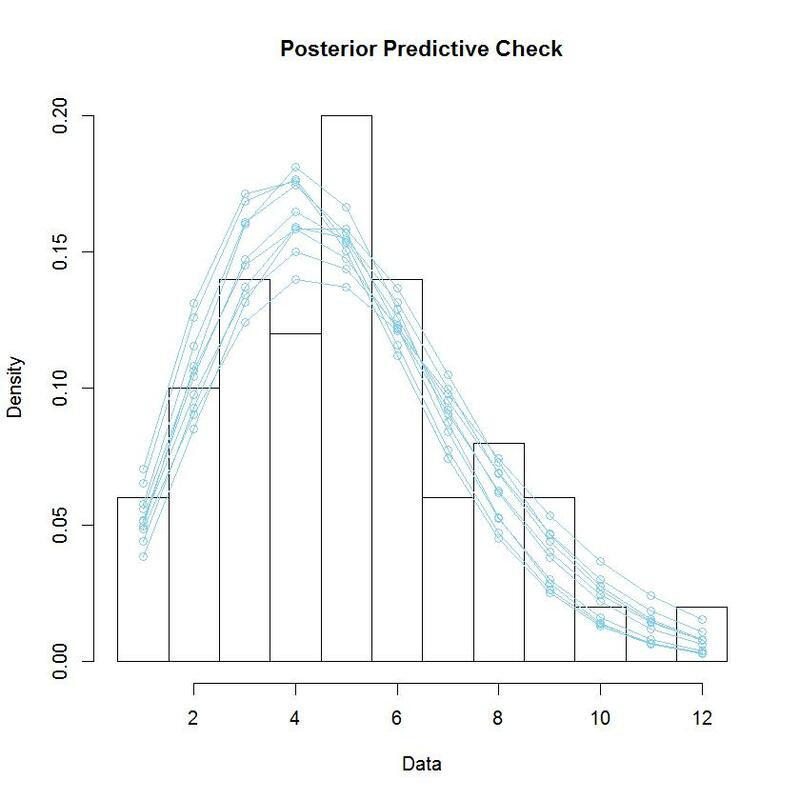 The decision rule can accept the null value (unlike traditional t tests) when certainty in the estimate is high (unlike Bayesian model comparison using Bayes factors). 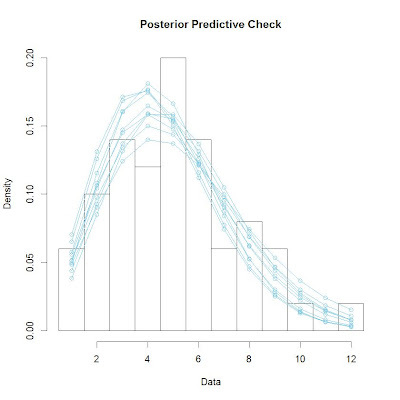 The method also yields precise estimates of statistical power for various research goals. The software and programs are free, and run on Macintosh, Linux, and Windows platforms. See this linked page for the paper and the software. 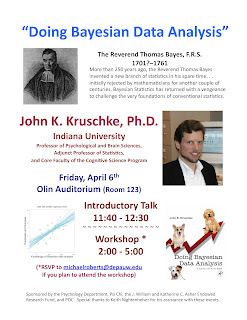 I'll be doing a talk and workshop at DePauw University. Details can be found here. 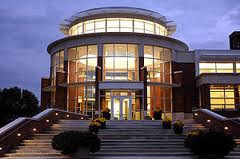 A list of future and past workshops can be found here. On their recent visit to St. Peter's Cathedral in Adelaide, colleagues Dan Navarro and Amy Perfors posed the book at the site of R. A. Fisher's remains. 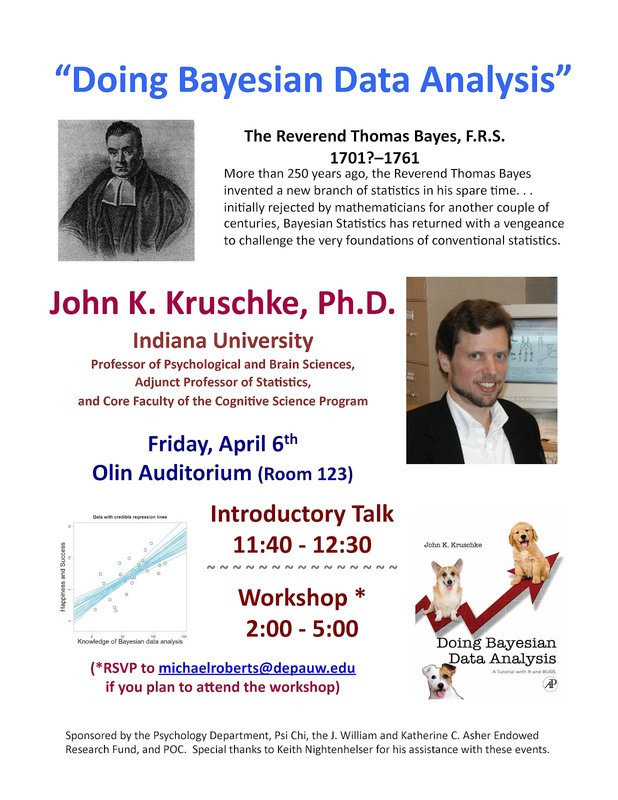 What is the probability of this happening if the null hypothesis were true? Many thanks to Dan and Amy! 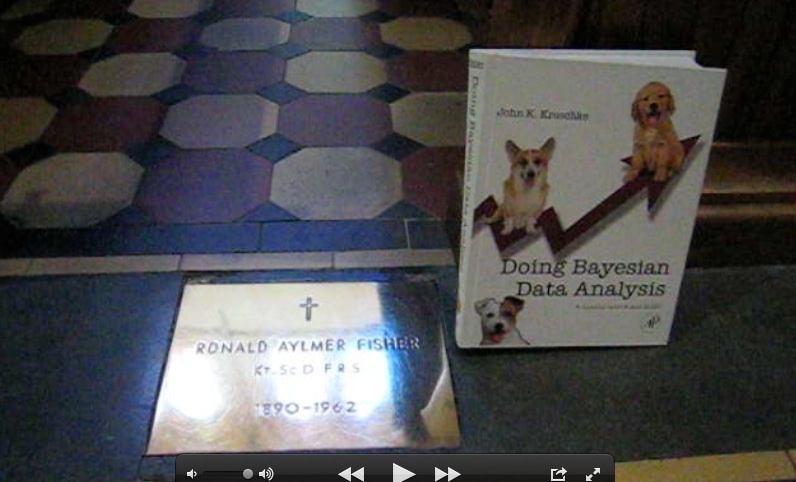 And see the book at Bayes' tomb, too.